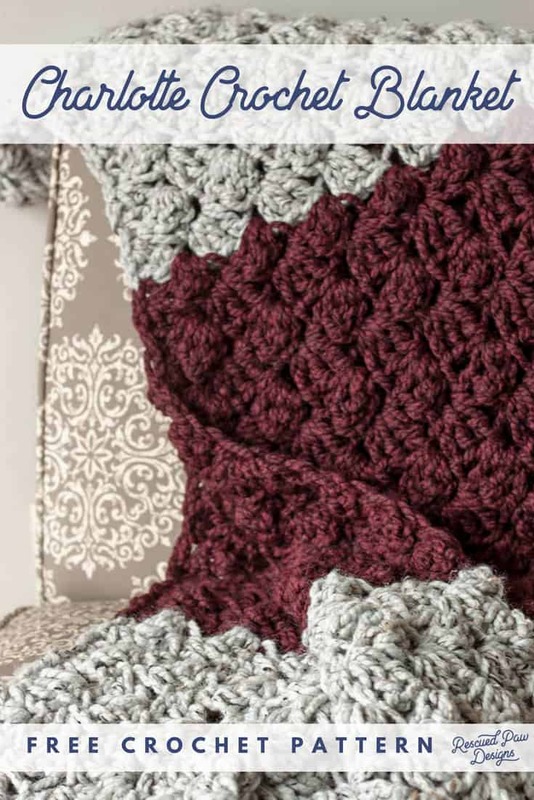 Learn how to make this easy crochet blanket pattern today with the FREE crochet pattern below. 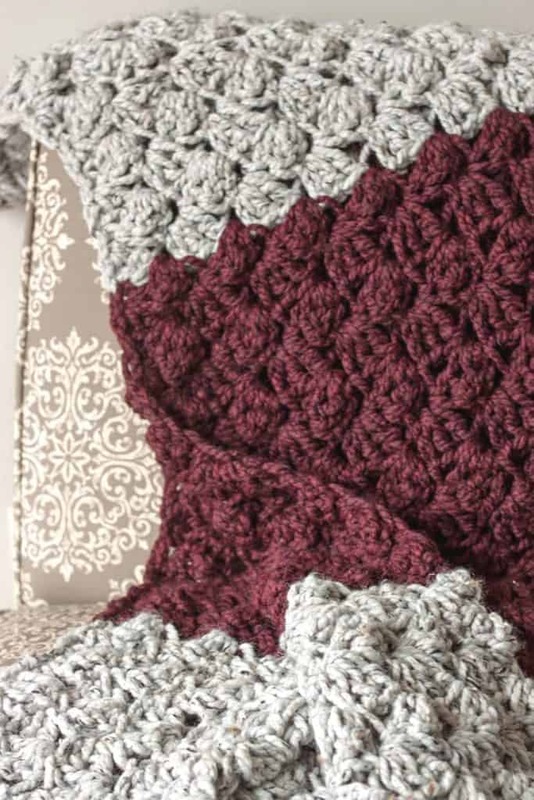 The Charlotte Crochet Blanket is a great beginner crochet pattern and uses only two basic crochet stitches! 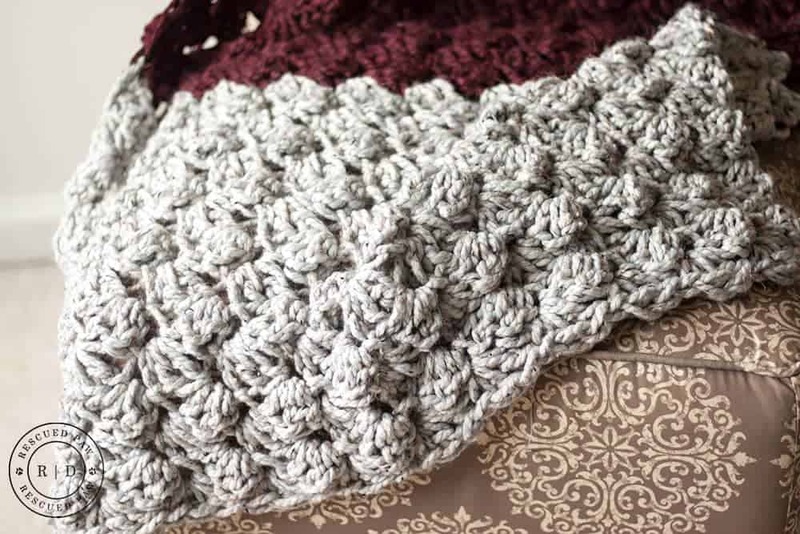 I would suggest this simple crochet blanket to anyone looking for an easy weekend project and if you would like another easy crocheted blanket then I’d suggest trying this chunky crochet throw too! If you’d prefer to have the PDF version instead that can be found “here” in my shop. 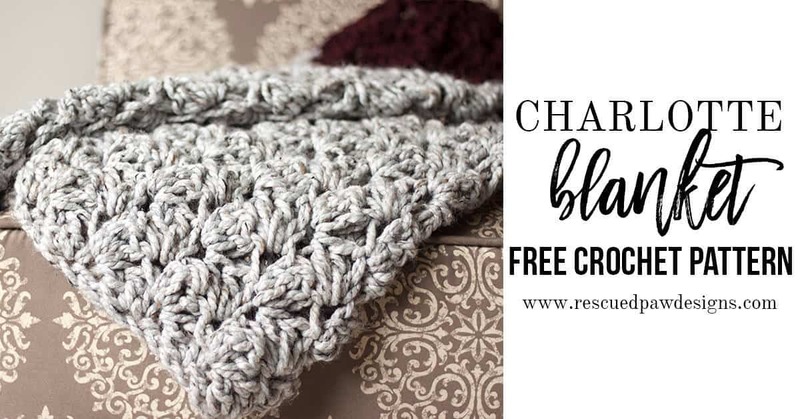 Otherwise keep on reading down for the full free crochet blanket pattern! 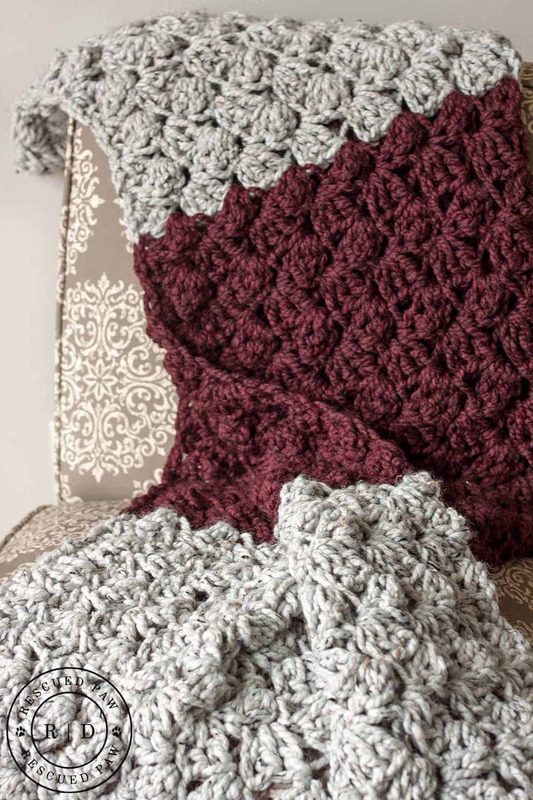 For my blanket I used Lion Brand Wool- Ease Thick & Quick in Gray & Claret which is a chunky yarn and so cozy to work with! 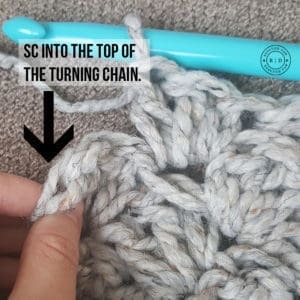 It is considered a super bulky yarn so whatever you are crocheting with it works up super fast! 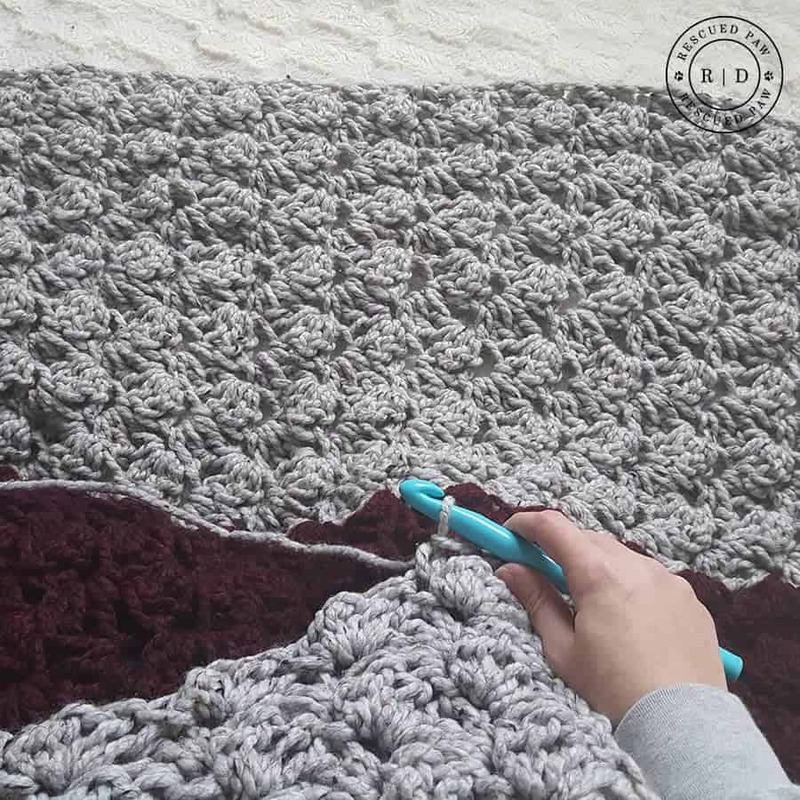 WANT to make a DIFFERENT SIZE crochet blanket? I also wrote up an AD-free PDF of this pattern because let’s face it some Ad’s are really annoying! But if I want to keep offering free patterns, then Ad’s are a must on here. Ready to get started on your new blanket? 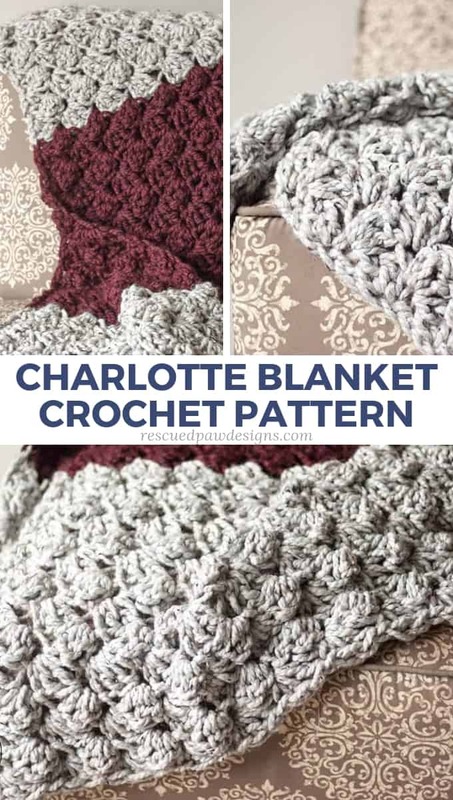 If you are not interested in the PDF keep on scrolling down to find the full, FREE version of the Charlotte Crochet Blanket below. Lion Brand Wool-Ease Thick & Quick Yarn – 4 skeins of Gray Marble & 2 skeins of Claret or 640 yards of any super bulky yarn to make as shown. “Click Here” to understand why gauge is so important. Find the AD-FREE PDF “Here”. Since I got all the notes out of the way now we can get on to the pattern. 🙂 Keep on scrolling down for the full, FREE crochet pattern! Chain a multiple of 3 – (27,30,33,36,39,42,45,48,51,54,57,60,63,66,69,72,75,78,81,84,87 etc) to begin your blanket. I used a starting chain of 45. FOUNDATION ROW: in 3rd CH from the hook do 2 DC’s, * SK 2 CH’s, in next CH do 1 SC & 2 DC’s, Repeat from * across until you are left with 3 CH’s, SK 2 CH’s, SC in last CH, turn. ROW 1: CH 1 (counts as a sc) in 1st ST do 2 DC’s, * SK 2 ST’s, in next ST do 1 SC & 2 DC’s, Repeat from * across until you are left with 3 ST’s, SK 2 ST’s SC at the top of the turning CH.. Turn. 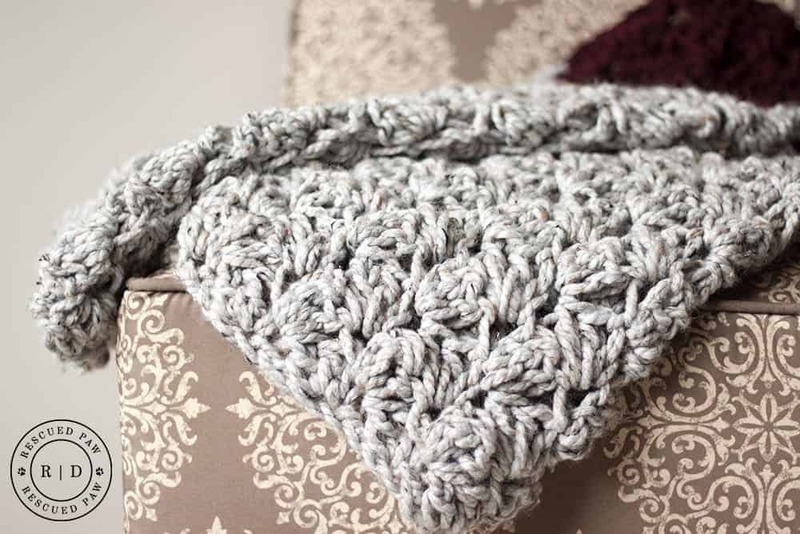 Weave in loose ends throughout the blanket with a large yarn needle. The blanket is now finished! Loved the Charlotte? Then you will probably love these blanket patterns too! The Neutral Chevron Blanket, Wonders Blanket and Rainbow Cluster Blanket. Nice to get beautiful free crochet pattern, I made such a long time ago. A long sweater out of squares, And I never have found good patterns like it. You should do a video tutorial! 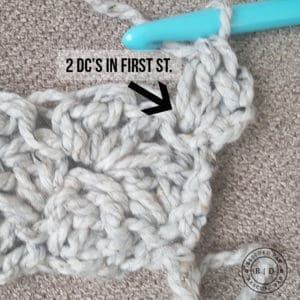 Easy but beautiful stitch. I will post a picture when I finish. Thank you. I am needing an easy crochet pattern for emotional comfort…. I hope this pattern is as accurate as printed! It looks peaceful and fun. Please make a video tutorial. Thanks for the pattern. I will post a picture when I am done. That may be a while☺. If I decide to do a border what would you suggest? Hi, I love this pattern! I just made this using lion brand thick and quick yarn with a Q size hook. It’s just beautiful. It worked very fast & it’s so easy to make a beautiful blanket. Here’s my issue… I made it for my granddaughter, but now I need to enlarge it. The finished product is only 2’x39″. It’s easy for me to add more rows for the length, but not sure how to add onto the side to increase the width. I need to make it wider than 2′ can you provide me with a easy fix for this problem. Thank you! To make it bigger you will need to work the starting chain in a multiple of 3 to your desired width. Then work the pattern as written. 🙂 Hope this helps! I’m suddenly working on this blanket and it’s bubbly. What am I doing wrong? I’m thinking of using this pattern with some super chunky Bernat Baby Blanket yarn I have. I love how soft the yarn is and want to make a pretty blanket for a friend’s baby girl. 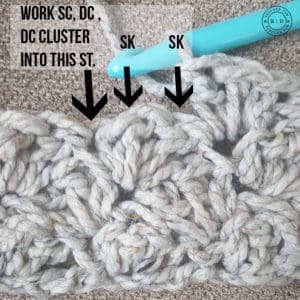 What size crochet hook for that type yarn on this pattern would be best? What would you suggest as a hook size if I use a worsted yarn instead? I’m trying to use yarn in my stash before having to go buy new yarn. Any help is appreciated.